At the end of an extraordinary week that began with rumors of a “cabinet coup” against Prime Minister Theresa May, featured a novel experiment in “indicative voting” to ascertain the preferences of the House of Commons in regard to the future relationship with the European Union and a statement by the prime minister to Conservative MPs that she will step down prior to subsequent negotiations with the EU if the withdrawal agreement were approved, today — the day on which, two years ago, the prime minister notified the EU of the UK’s intention to leave and the day on which it was expected to leave, with or without an approved agreement — the UK rejected for the third time, and by a decisive margin, the agreement. As a result, the UK will leave the EU on April 12, two weeks from today — unless it requests a further extension, meets the conditions for one set last week by the European Council, and all of the other 27 member states agree to grant one. Last week, after John Bercow, the Speaker of the House, ruled that the House could not vote for a third time on the withdrawal agreement and political declaration on the future relationship that had been rejected on Jan. 15 and again on Mar. 12 because there had not been a “substantial change” in the motion from the one that was rejected on Mar. 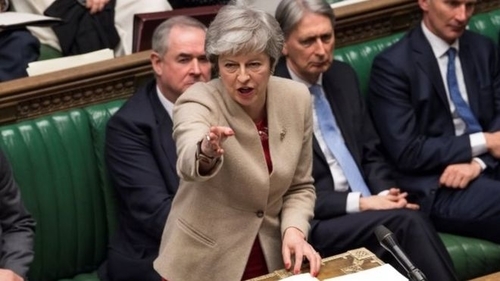 12, the prime minister wrote to Donald Tusk, the president of the European Council, and requested that the Council, meeting the next day, formally approve the supplementary documents she and Commission President Jean-Claude Juncker had agreed in Strasbourg on Mar. 11. That, she said, would allow the government to claim there had been a “substantial change” in the agreement so it could be presented again to the House. She also requested that, in the event the speaker approved a third vote and the House approved the agreement, the exit date be extended from Mar. 29 to June 30. Last Friday, the prime minister wrote to all MPs informing them of the Council’s conclusions. In concluding, she noted that the Council’s decisions left all the options open but there was a cost attached to each: the UK could revoke its Article 50 notification of its intent to leave, but that would “betray the result of the referendum;” leave with no deal on April 12, but the House had already said that is not something it would support; ask for another extension before April 12 if it appeared there wasn’t sufficient support to bring the deal back to the House this week or the house rejected it again, but that would require holding the European Parliament elections; or leave on May 22, but that would require the Speaker to allow a third vote and, of course, sufficient support to approve the agreement. On Wednesday, the Speaker selected eight of 16 motions put forward by MPs for inclusion on a single ballot on which the MPs would say yes or no to each motion. Among the motions chosen were ones that proposed leaving the EU without a deal on April 12; joining the European Economic Area and negotiating a customs union; participating in the European Free Trade Association and EEA without a customs union; a customs union; Labour’s alternative of a permanent customs union and regulatory alignment with the EU; revocation of the Article 50 process to avoid a no-deal exit; a confirmatory public vote on the withdrawal agreement; and a contingent preferential arrangement. As it turned out, the clear winner in this novel parliamentary process was “none of the above.” With Conservative MPs voting heavily against most of the options except for the no-deal exit on April 12, all eight options received more ‘no’ votes than ‘yes’ votes. But there were several that registered a substantial amount of support: 268 MPs voted for (although 295 opposed) a confirmatory public vote on the agreement prior to the ratification and implementation of any withdrawal agreement and framework for the future relationship; 264 voted for (although 272 opposed) a customs union with the EU; 237 voted for (although 307 opposed) Labour’s alternative; 188 voted for (although 283 opposed) membership in the EEA and a temporary customs union with the EU; 184 voted for (although 293 opposed) revoking the Article 50 notification in order to avoid a no-deal exit; and 160 voted for (and 400 opposed) a no-deal exit on April 12. Other than the no-deal exit, for which 157 Conservatives voted in favor, there was only a smattering of Conservative support for the other options. Based on a decision taken before the vote, the Speaker will select several of the options (and perhaps others as well) for a follow-up vote on Monday in which MPs will be asked to indicate their preference among the several options. As the “indicative votes” were being counted, the prime minister met with the 1922 Committee, the grouping of Conservative backbenchers. In an emotional appeal for support in a third vote on the withdrawal agreement, should the Speaker agree that the European Council Decision constituted a “substantial change,” she indicated that, if the House approved the agreement, she would step down as party leader and prime minister prior to the resumption of negotiations about the future relationship with the EU. On Thursday afternoon, Andrea Leadsom, the Leader of the House, put forward in the prime minister’s name a motion that recognized the terms and conditions agreed by the European Council at last week’s meeting and asked the House to approve the withdrawal agreement in accordance with the European Council’s stipulation that it had to be agreed by the end of this week in order to delay the UK’s exit to May 22. Since the withdrawal agreement is a legally-binding treaty between the UK and the other EU member states while the political declaration is a non-binding aspirational statement that the EU has been willing to continue discussing in recent weeks, while some MPs objected to voting just on the agreement, the EU did not; indeed, it made it clear in last week’s European Council conclusions that the UK needed only to approve the withdrawal agreement by the end of the week in order to delay the exit date to May 22. The Speaker, who was involved in discussions with the government about the motion, announced just before Leadsom spoke that, because the motion no longer included the political declaration and included the new set of dates and conditions stipulated by the European Council last week, it satisfied his ruling that it had to be substantially different from the one rejected on Mar. 12 and the vote could therefore proceed. And so this morning the House voted yet again on the withdrawal agreement. And to no one’s surprise, it rejected it yet again and by a substantial margin — 286 in favor and 344 against. While substantially fewer Conservatives — 34 — voted against the agreement today than on Jan. 15 (118) and Mar. 12 (75), the votes of those 34 MPs, combined with those of the 10 DUP MPs, were enough to defeat the deal. Had those 44 MPs voted in favor, the agreement would have been approved. As a result of today’s vote, the exit date has been extended, but only by two weeks, to April 12. Immediately after the vote, Donald Tusk called an emergency meeting of the European Council on April 10, at which it will expect the UK to “indicate a way forward.” If the UK decides not to hold the European Parliament elections on May 23, there will of course be no way forward and the UK will leave in the hardest and most economically-costly Brexit on April 12. If, on the other hand, the UK decides that it will participate in the elections, there will be a possibility of a “long extension” — indeed, possibly a very long one; on several occasions in recent weeks, Tusk has suggested an extension could, if need be, run to the end of 2019 or even the end of 2020. But there’s another condition, beyond participating in the European Parliament elections — something that many Brexiters strongly oppose — that would have to be satisfied in order to persuade the European Council to grant a further extension beyond April 12: As Tusk, French President Emmanuel Macron, Dutch Prime Minister Mark Rutte and others have said, if the UK wants a further extension, it will have to come to the European Council meeting on April 10 with a clear purpose for which there is strong political support. That, of course, means it must decide what it wants in terms of its future relationship with the EU and there must be a strong and stable basis of political support for achieving that objective. It goes without saying that a minority government — especially one that is as deeply and bitterly divided over Brexit as the Conservatives are — cannot, by definition, satisfy that condition. Given the current partisan composition of the House of Commons, that condition can only be satisfied by a broad cross-party coalition. The first evidence of whether such a coalition might be possible will come in the run-off round of “indicative voting” on Monday. In the meantime, the Brexit clock is still ticking — now toward 11 p.m. on April 12.